Grass trees are now flowering in our garden and in the reserves around us in Mount Helena, Western Australia. I think these are flowers of very young grass trees shooting up long, winding spindles through Jarrah forest to reach the light. This entry was posted in All Posts, Inktober 2015, Sketches and tagged #Inktober 2015, Grasstree, Ink, Pen, Western Australia on October 24, 2015 by Helen. This summer in the Perth hills the temperature has topped 40 degrees centigrade on way too many days. Today is to be the last day of the latest heatwave. Today also marks a whole month without rain at Balligar! It reminds me to take care of our environment. Happily the bush around us is standing up to the harsh conditions well and various birds are chortling in the Jarrah trees as I type at dawn. 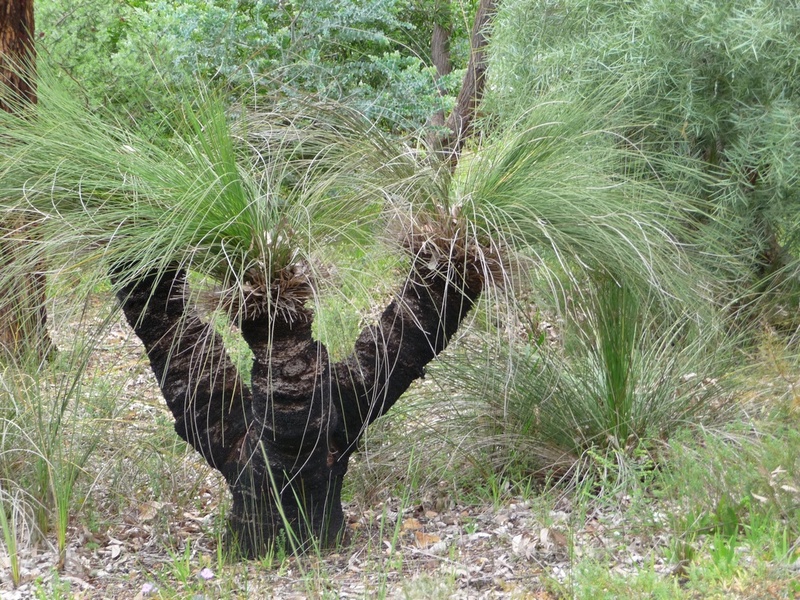 Amazing resilience – like the grasstrees around us that must be decades old as Xanthorrhoea grow very slowly. I do think their politically incorrect name of ‘Blackboys’ is much more descriptive. There is one old fellah (probably also politically incorrect) in the reserve behind us that has the character of a centenarian – I so want to paint him – er, it! 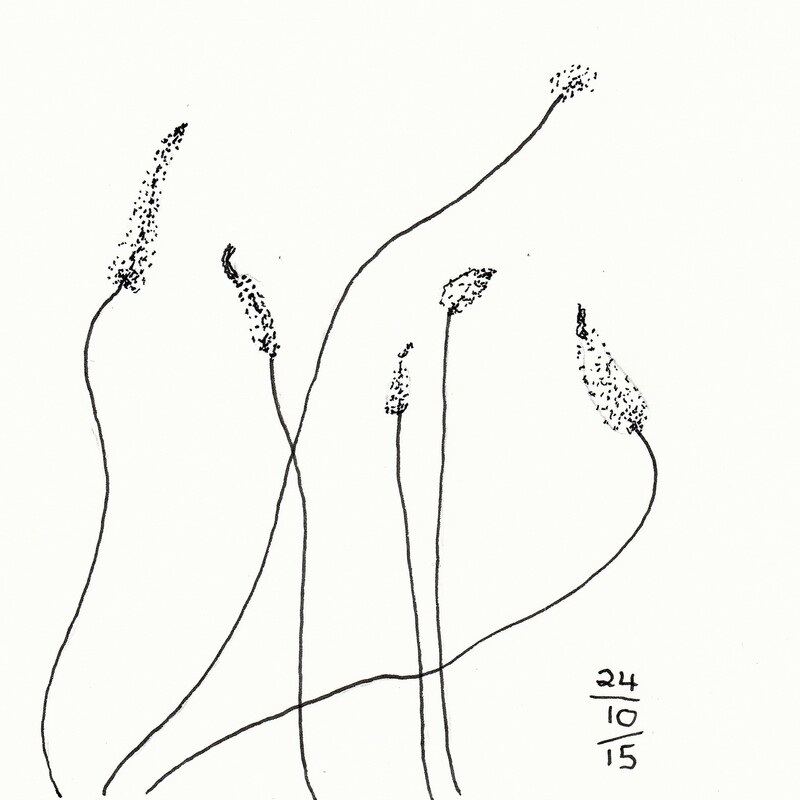 I have sketched and painted a group of three grasstrees on our block. I reduced their surroundings to the red, bare earth and sky so as to emphasis the feeling of rejection / dejection of the little guy on the right and called it ‘Two’s Company’. It’s about 900 by 600 cm. This was painted using the same limited palette of acrylics as the Pincushion Hakea Laurina I posted about last time. (Lemon Yellow, Cadmium Light Red, Ultramarine, Phthalo Blue and Phthalo Green). The colours are not so garish as they look here. Phthalo colours don’t seem to photograph well. The painting is a good example of ‘happy accidents’ if nothing else. I finished the painting and laid it flat to varnish it – and then spilt rubbing alcohol on it!@#$!! One big drop dissolved a hole in the sky back to bare canvas. Oh what to do!! I knew that it would look obviously patched if I tried to paint the sky back as it was. In desperation I decided the blob would have to become the moon and that a cloud coming in from the right would help camouflage the damage. I think the changes actually improved the composition. If you look closely at the real painting, you can see that the little dark marks in the sky are dragonflies. Expect to see more dragonflies in my work! If you have any examples of happy accidents, do share! This entry was posted in All Posts, My Paintings Stories and tagged Art, Australia, Grasstree, Inspiration on February 13, 2013 by Helen. What’s in a Name? Why BalligART? I’m so encouraged by all the supportive comments I’ve received – a big thank you to you all! I decided to call this site BalligART because our home in the Darling Ranges is called Balligar and this is where I have my studio (formerly a formal lounge) and where I am surrounded by inspiration – the flora of the Australian bush. We named our home Balligar as it means ‘Grasstree’ in the local Aboriginal Noongar language and we are lucky to have many of them on our block. This is one of them – or three? 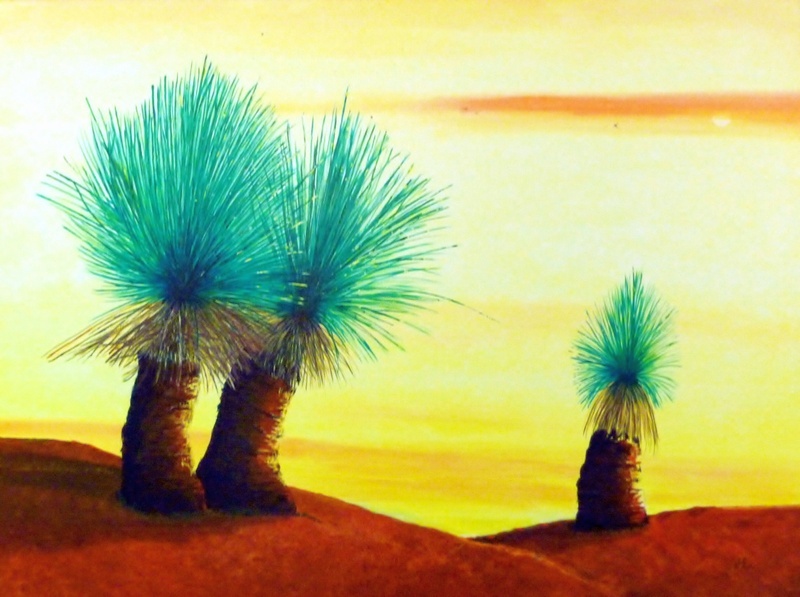 The grass trees have inspired paintings of course! I’ll post about them another time. 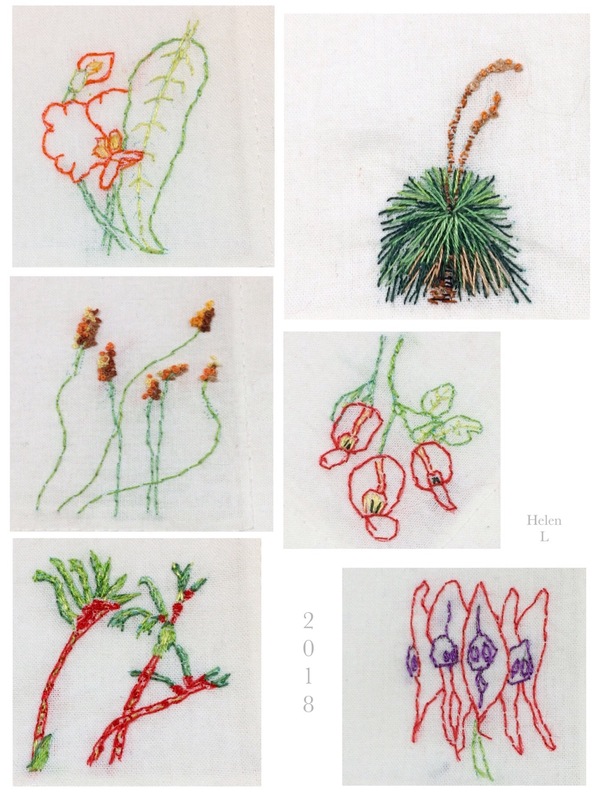 BalligART’s icon is, for now at least, my painting of a Pincushion Hakea Laurina flower. This Hakea is a native of south west Australia. It is quite a large shrub that has beautiful pincushion like flowers that are no more than 5cm across and so often go unnoticed. I decided to paint a single flower and to paint it BIG and to paint it in such a way that it gets noticed! I felt bold when I painted it as it was the first time I’d painted anything so big. So it seemed a fitting icon – it reminds me to be bold and get noticed! The acrylic painting is 1 metre square and certainly has presence! In reality the colours of the painting, particularly the greens, are richer but hopefully this photo gives you a reasonable impression. I was pleased that underpainting the flower head in layers of transparent Lemon Yellow and then layering with glazes of Cadmium Red Light and Ultramarine (in the shadow areas) really worked to give a 3D effect and to make it glow! Whilst the flower head is pretty realistic the background obviously isn’t. I thought that a less than realistic background would increase the focus on the flower. Also, it was a deliberate decision to use a limited palette for this and a number of other paintings so they complement each other. I used masking fluid (normally used in watercolour painting on paper and not on canvas) on the styles while I painted the ball of the flower head and the background to avoid a ‘painted around’ look. It took me 6 hours to remove the masking fluid! I’ve since thought that it might have been a better option to underpaint the styles with the very opaque Titanium White after painting everything else! PS: It was a triumph to get images into the right place in the post – wrapping text around them is a challenge for another day! 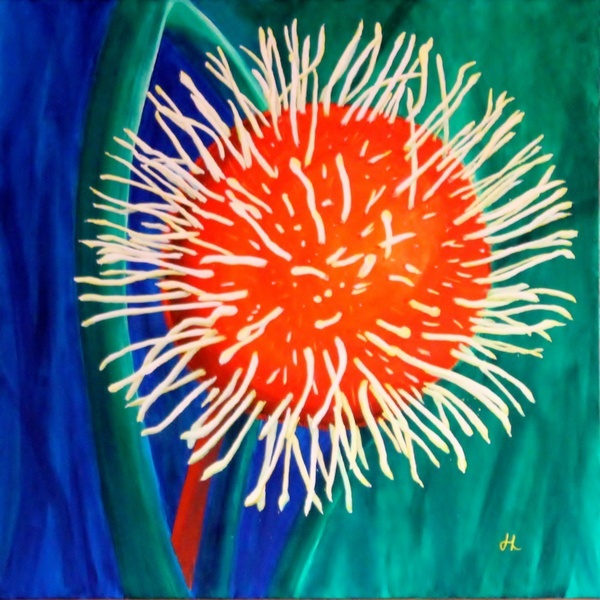 This entry was posted in All Posts, My Paintings Stories and tagged Art, David Hockney, Grasstree, Inspiration, Pincushion Hakea on February 12, 2013 by Helen.